For bugs or issues with the game, see this page. at 12pm Pacific / 3pm Eastern. Sony's (obviously) involved in whatever BioWare is announcing today. They are supposedly going to talk about their new/upgraded console at this event, so it's either a collaboration (VR, etc).. or an exclusive. And if it's an exclusive? Calling it now - closing their forums may have been the best decision BioWare has ever made. If it's an exclusive, perhaps it's only a timed one. Apologies for the inconvenience - I know many of you use the comments on the Inquisition Bug pages. Google Sites only had one gadget for Disqus commenting and it appears to have gone away, so the comments site-wide are broken. They will return when I re-point the site after the move is complete. I only have about 150 more pages to do. They all need to be hand-imported since the HTML here is so weird, and different from what I'm using on the new site - there is no mass-import tool. Google Sites does not use standard html, links, or other things (part of the reason I'm moving it). BioWare is shutting down their forums. I've put the post up in its entirety since the forums are not just being archived - they're being completely deleted. Except for bsn and topshelfgaming I would highly, highly suggest - if you want drama-free and stable - to stay away from any other "bioware" or "bioware social networking" forum currently set up at boards.net (proboards). Follow the links on this page to get to the correct ones. I do not make this warning lightly, and I am not being melodramatic. If you feel I have missed a forum there that should be included in the "drama-free and stable" list, please contact me and let me know.. otherwise, it is definitely in your best interest for forums at boards.net to go with a) bsn.boards.net for Mass Effect and Dragon Age, or b) topshelfgaming.boards.net for general gaming and off-topic.. and to leave any others you may find there alone. There are a couple of other fine forums not located on boards.net, and I will keep the list updated as I discover others. Fexelea, site owner and very-long-time BioWare Forumite, is importing all Dragon Age and Mass Effect threads from the BioWare forum as we speak. 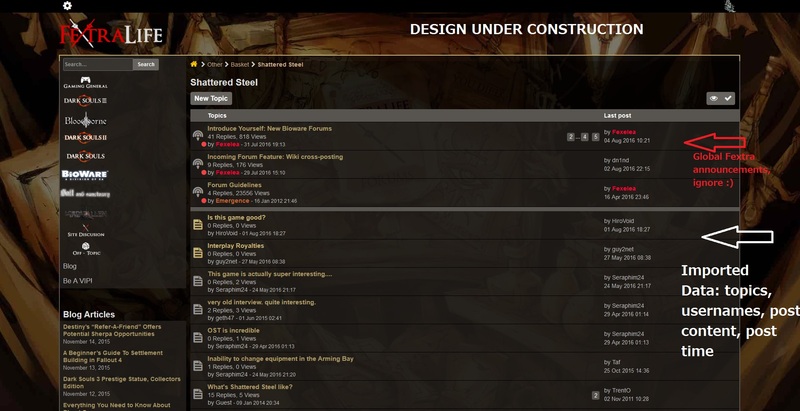 The forums are being imported to archive them. This is an absolutely huge undertaking on her part, in time, energy, and funds. The forums and threads will be imported into the same configuration as they are now, with everyone's images, videos, memes, and documents intact. If you do not see this until after the forums go read-only on August 26, you can still follow the instructions in that post - when you get to the point where you would post your usernames, send a message to fexelea via your EA account instead. If you are unable to do so, contact me here with your username from both fextralife and the BioWare forum and I will pass the information to her. These are not competing boards - you could join them all and get something different from all of them. Topshelfgaming was set up as off-topic when BioWare shut down their Off Topic boards and tried to force those discussions into the rest of the forum. Vroomvroom is another of the same with a different moderating style (more strict). Fextralife has other game forums such as Dark Souls 3, and wikis and articles for the games as well. So there is a board for every play/chat style - even more than one. I am still gathering my thoughts about this and will post them later; wanted to get the list of possible new forums out first. I've messaged quite a few people on the board about this so that they know - 90% have not logged in for a very long time, and the rest I could not tell because that part of their profile was set to private. A few of them have signed on and posted in Fexelea's thread, and I'm hoping more make it before the forums go read-only. Is everyone landing safely? Don't be afraid to tweet, post, or email about this so that people who have been gone from the forum for a while can find out about it. Spread the word! Archiving this here in case it suddenly goes away on the BioWare forum. Where Fexelea says in the instructions to "post here and leave your usernames", actually do that at the original post if possible: https://forum.bioware.com/topic/575315-claim-your-account-saving-your-post-history. If it is not possible to post there any longer, try reaching her on her site (www.fextralife.com), and if that doesn't work contact me; let me know that information and I will get it to her. I would like to give everyone the option of continuing your discussions with your posting history/post count intact. You get a (f)extra life! 2. Reply to this thread naming your Fextralife account. This will enable me to create a "masterlist" for merging Fextra user >< Bioware user and assigning your bioware posts to the account. I don't like the theme! The board is undergoing a redesign. It will look more modern and responsive when we are done. We will also introduce option of dark or light scheme. Why aren't you merging this with the boards setup by other members at proboards? Why isn't this on it's own domain? Getting a domain off the ground is a really intensive task. I believe that communities can grow, and given the success of the off-topic boards here before I think merging into a gaming community could give that outlet in a natural manner. Please PM me - I'm very happy to welcome active community members to positions of responsibility. Since we have an active forum, we already have a recruitment process with simple questions. Please be aware all moderators are required to sign a non-disclosure agreement to protect user privacy. I will focus on the larger boards first, and legacy games second. I do not know what to do about the language boards at this stage, as they seem to add a lot of clutter to an already huge board. I host these myself, they won't be shutting down and I won't be getting bored of it anytime soon. We have hosted large forums for years, you can join an existing, bug-tested and reliable forum with an established track record. Current moderation is impartial, your opinions are welcome (with civility of course). No fan will be ostracized for their choices and we don't lock topics frequently. Advertising is completely handled by us, there's one ad on the footer, you won't be seeing any malware from bad ads. You get immediate editing access to all our wikis. Our Dragon Age Inquisition and Mass Effect Andromeda wikis will be cross-posting comments to their respective boards as well, assisting with Q&A. After great consideration, we are closing down the BioWare forums, effective August 26, 2016. The Star Wars: The Old Republic forums will continue to operate; however, our public boards for Dragon Age, Mass Effect, and legacy BioWare titles will no longer be available. This wasn’t an easy decision. Our players are important to us. Your feedback, stories, and love for our games drive and inspire us. In the past, our forums were the only way we could speak to you directly. They allowed our developers to talk with fans, and gave our players the opportunity to talk with each other about our games. But with the rise of social media and geek culture, there have never been more ways for us to connect. Now we can travel around the world, meeting with you face-to-face at events like PAX, SDCC, and even shows in our own backyard. We can share stories with you on the go, giving you a look behind the scenes on sites like Facebook, Twitter, YouTube, and Instagram. In turn, you’ve built your own fantastic communities in places like Tumblr and Reddit. You’ve created comprehensive Wikis and countless pieces of fantastic art, fiction, and cosplay. With so many great things so widely available, our developers today find themselves spending more time on other sites, and less time in our own forums. And to our fans and players who came to those boards looking to talk to us, it was a great disservice. So it is with a heavy heart that we will close our public forums on August 26, 2016. We will maintain some private boards, and may use these in future for beta feedback or other special projects. Because we know there is a lot of information on there you may want to keep, the public boards will remain in a read-only state until October 25, 2016. After that date, they will be taken down. While we are saying goodbye to this venue, we remain committed to our community and will always be here to listen, share, and support you. Online and in person, we will continue to seek out opportunities to interact and share in our combined love of games. Nach reiflicher Überlegung haben wir beschlossen, die BioWare-Foren zum 26. August 2016 zu schließen. Die Foren von Star Wars: The Old Republic wird es weiterhin geben, aber unsere öffentlichen Foren für Dragon Age, Mass Effectund ältere BioWare-Titel werden nicht mehr verfügbar sein. Diese Entscheidung ist uns nicht leicht gefallen. Unsere Spieler sind wichtig für uns. Euer Feedback, eure Geschichten und eure Begeisterung für unsere Spiele treibt uns an und inspiriert uns. In der Vergangenheit waren die Foren unsere einzige Möglichkeit, direkt mit euch in Kontakt zu treten. Unsere Entwickler unterhielten sich mit Fans und gaben unseren Spielern Gelegenheit, sich untereinander über unsere Spiele auszutauschen. Aber der Aufstieg der sozialen Medien und die Geek-Kultur haben uns neue Kommunikationswege eröffnet. Heute reisen wir um die Welt und treffen euch persönlich, bei Events wie PAX, SDCC und sogar bei Shows direkt bei uns. Wir können jederzeit Geschichten mit euch teilen und euch auf Sites wie Facebook, Twitter und Instagram Einblicke hinter die Kulissen geben. Ihr wiederum habt fantastische Communitys an Orten wie Tumblr und Reddit aufgebaut. Ihr habt umfassende Wikis und unzählige großartige Werke in den Bereichen Design, Fiction und Cosplay erstellt. Es ist so viel überall verfügbar, dass unsere Entwickler immer mehr Zeit auf anderen Sites verbringen und immer weniger in unseren eigenen Foren. Und das war natürlich nicht gut für die Fans und Spieler, die diese Foren besuchten, weil sie mit uns reden wollten. Darum haben wir schweren Herzens beschlossen, unsere öffentlichen Foren am 26. August 2016 zu schließen. Es wird weiterhin einige private Foren geben, die wir künftig für Beta-Feedback oder andere spezielle Projekte benutzen werden. Wir wissen natürlich, dass auf den Foren viele Informationen liegen, die ihr vielleicht aufbewahren wollt. Daher werden die öffentlichen Foren noch bis zum 25. Oktober 2016 zur Verfügung stehen, ihr könnt allerdings nicht mehr posten, nur noch lesen. Nach diesem Datum schalten wir sie ab. Wir verabschieden uns zwar von diesem Medium, bleiben aber unserer Community verbunden und werden immer da sein und euch zuhören, Informationen teilen und euch unterstützen. Wir werden online und persönlich Möglichkeiten zur Interaktion schaffen, damit wir auch in Zukunft unsere gemeinsame Leidenschaft für Spiele teilen können. Po długim namyśle zamykamy fora BioWare z dniem 26 sierpnia 2016. Nadal będą funkcjonować fora gry Star Wars: The Old Republic. Publiczne fora serii Dragon Age i Mass Effect oraz starszych tytułów BioWare nie będą już jednak dostępne. To nie była łatwa decyzja. Gracze są dla nas ważni. Wasze uwagi, historie i miłość do naszych gier stanowią dla nas inspirację. W przeszłości fora były jedynym sposobem, w jaki mogliśmy nawiązać z wami bezpośredni kontakt. Pozwalały naszym developerom rozmawiać z fanami i dawały graczom możliwość dyskutowania o naszych grach. Rozwój mediów społecznościowych i kultury geekowskiej sprawił jednak, że mamy teraz znacznie więcej kanałów komunikacji. Dziś możemy podróżować po całym świecie, spotykając się z wami twarzą w twarz na imprezach takich jak PAX, SDCC czy nawet na naszym podwórku. Możemy dzielić się z wami historiami na gorąco i pokazywać wam naszą pracę od kuchni na portalach takich jak Facebook, Twitter czy Instagram. Wy z kolei stworzyliście własne wspaniałe społeczności w miejscach takich jak Tumblr czy Reddit. Stworzyliście obszerne wiki i niezliczone, fantastyczne grafiki, teksty i cosplaye. Tak powszechna dostępność różnorodnych materiałów sprawia, że nasi developerzy coraz więcej czasu spędzają na innych stronach, a coraz mniej na naszych forach. To nie było w porządku w stosunku do naszych fanów i graczy, którzy przychodzili na fora, żeby z nami porozmawiać. Z ciężkim sercem podjęliśmy więc decyzję o zamknięciu naszych forów publicznych z dniem 26 sierpnia 2016. Część forów prywatnych będzie podtrzymywana i może zostać w przyszłości wykorzystana do zbierania komentarzy do wersji beta lub innych projektów specjalnych. Wiemy, że fora publiczne zawierają dużo informacji, które moglibyście chcieć zachować, będą więc podtrzymywane w trybie tylko do odczytu do 25 października 2016. Po tym dniu znikną. Żegnamy się z tym miejscem, ale nadal mocno stawiamy na kontakt ze społecznością – zawsze chętnie was wysłuchamy, podzielimy się z wami informacjami i pomożemy wam rozwiązać problemy. Będziemy nadal szukać okazji do interakcji, w sieci i na żywo, żeby wspólnie z wami cieszyć się naszą miłością do gier. Au terme de longues réflexions, nous fermerons les forums de BioWare à dater du 26 août 2016. Les forums de Star Wars: The Old Republic resteront opérationnels, mais ceux de Dragon Age, de Mass Effect ou d'autres titres plus anciens de BioWare ne seront plus disponibles. Ça n'a pas été une décision facile. Nos joueurs sont importants pour nous. Vos commentaires, vos histoires et votre passion pour nos jeux sont pour nous une source d'inspiration et d'encouragement. Avant, nos forums étaient le seul moyen pour nous de communiquer avec vous directement. Ils permettaient à nos développeurs d'entrer en contact avec les fans et offraient la possibilité à nos joueurs de parler de nos jeux entre eux. Mais avec l'apparition des réseaux sociaux et l'avènement de la culture geek, on n'a jamais eu autant de moyens d'échanger. Aujourd'hui, nous pouvons faire le tour du monde et vous rencontrer en personne lors de salons comme le PAX, le SDCC voire de nos événements à nous. Nous pouvons partager des anecdotes avec vous et vous faire entrer dans les coulisses sur des plateformes telles que Facebook, Twitter et Instagram. Devant autant de moyens de communication, nos développeurs sont aujourd'hui amenés à passer moins de temps sur nos forums que sur d'autres sites, ce qui n'est guère pratique pour nos fans et les joueurs venus sur ces forums dans le but de nous contacter. C'est donc le cœur lourd que nous fermerons nos forums le 26 août 2016. Nous ne conserverons que quelques bulletins privés que nous utiliserons éventuellement à l'avenir pour la publication de commentaires sur une version bêta ou pour d'autres projets particuliers. Conscients que ces forums contiennent de nombreuses informations que vous souhaitez peut-être conserver, les forums publics resteront ouverts en lecture seule jusqu'au 25 octobre 2016, après quoi ils seront désactivés. Cet adieu à nos forums ne change rien : nous restons fidèles à notre communauté et serons toujours là pour vous écouter, échanger avec vous et vous aider. En ligne ou en personne, nous serons toujours ravis de communiquer avec vous et de partager notre passion commune pour les jeux. Father's Day is this Sunday! If you have not gotten anything for Dad yet, there are a couple of pretty good sales going on right now. I've been working 80-hour weeks lately, so I'm behind on sales notices (sorry!). Hopefully these help a few people even though Origin's is nearly over. Origin - up to 75% off during their Infinite Gaming Sale until this coming Tuesday (June 21), including Dragon Age: Inquisition: Game of the Year Edition is only $19.99! Microsoft is having a sale starting Saturday. Cutting it a little close for Father's Day, but I'll put those links up Saturday morning. Save $20 off purchase of Dark Souls III at GameStop.com! GameStop Exclusive Titanfall 2 Deluxe Collector's Edition now available for preorder. Contains Illuminated Pilot Statute, art prints and game. Available only at GameStop. Shop for New Xbox One bundles starting at just $279 at GameStop.com! New Xbox One S 2TB Launch Edition console now available for preorder at GameStop.com. Destiny: Rise of Iron - Pre-order and get the black and silver Iron Gjallarhorn Rocket Launcher. Pre-order the Pip-Boy Deluxe Bluetooth Edition today. Reserve today, supplies Limited! $20 off Guitar Hero Live at GameStop.com! Save $20 Off a select PS4 or XB1 Refurbished Turtle Beach Headset with your Pre-Order of Call of Duty: Infinite Warfare. Offer is valid while supplies last and is subject to availability. Offer expires 7/12/16. Father's Day Sale! Save up to 50% on select Star Wars Collectibles at GameStop.com. Save $10 off purchase of Dead Pool at GameStop.com! $18 off purchase of Mirror's Edge Catalyst! Shop GameStop.com now. Your Choice! Shop The Last of Us Remastered, Until Dawn, & Bloodborne for only $19.99 at GameStop! We've signed up much earlier this year to hopefully reach our goal this time! We'll be supporting the Richmond, VA Children's Hospital again through Extra Life. Please donate to help the children! We'll be playing and donating all through the year, with a big weekend in the planning stages for Extra Life Day on November 5, 2016. Mark your calendars! We have a modest goal of $500 in donations. Together we can meet or exceed it! We'd love to smash that goal right out of the ball park. Your donation is tax-deductible and ALL PROCEEDS go to help kids. Any funds donated on our sponsor page will go directly to the Children's Hospital in Richmond, Virginia. To find out more about Extra Life, click here, and click here to donate to the cause on our page and help us meet our goal to help the children. Watch the video there to see how it all came to be and why your help is needed. Thank you in advance! and let us know after you've donated! Thank you so much. As you can probably guess from my past posts, I'm an Amazon fanatic. I love their Prime and have been a member for quite a few years. But I'd never heard of Amazon Underground until today. I'm not sure how long it's been there, but I'm SO glad I found it! For starters, you can get Star Wars: Knights of the Old Republic - free - on your Android phone or tablet! It's quite huge (2.1GB) but if you have the bandwidth and the room, you can take one of the all time classic games with you anywhere. The games and apps available are totally free, including in-app purchases. So if you would normally need to buy extra lives or extra features, even those are included at no cost. First, for your Android phone, get the Underground app (it's the normal Amazon app, it just includes Underground). If you have a Kindle Fire tablet, it should already include Underground. Other non-Fire Android tablets will probably need to download it, but check the menu in the app first to see. Launch the app, open the left menu, and choose Underground. Search or browse to find more fun stuff ;) There are books, comics, games, apps.. you name it. There are usually non-free versions of the same item, so make sure it says, "actually free" along with the $0.00 price tag. You can search on your PC, and send apps to your compatible devices from the web site. 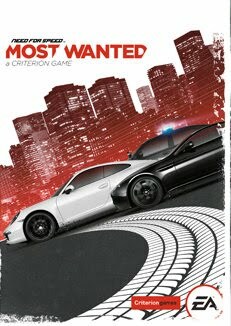 Origin's On the House: Need for Speed - Most Wanted, Free! Just what the title says... Need for Speed - Most Wanted is currently free on Origin's On the House! The open-world action in Need for Speed Most Wanted gives you the freedom to drive anywhere, discover hidden gameplay, meet up with your friends or just hang out and toy with law enforcement. Lose the cops … your way. Hit jumps and shortcuts, switch cars, lie low or head for terrain that plays to your vehicle’s unique strengths. Hit the gas and fight your way past cops and rivals using pure driving skill, aggression, high-end car tech and tons of nitrous. It’s all about you, your friends and the wildest selection of cars in a heavily policed, urban landscape.